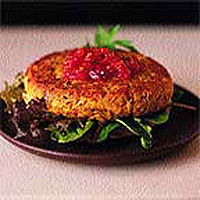 For a Mediterranean touch, try these bean burgers with salad and chutney. Using a potato masher, mash the beans until smooth. Mix with the pesto, breadcrumbs, red onion, egg and black pepper to taste. Brush a large non-stick frying pan with the oil and heat gently. Spoon the mixture into the pan, making 2 separate piles. Using the back of the spoon, gently pat out into 2 burger shapes, and cook for 4-5 minutes on each side, or until golden brown. Preheat the grill. Split open the bread roll and lightly toast the cut sides under the grill. Pile the leafy salad on each half and top with the bean burgers. Finish with a spoonful of chutney. Serve warm. Switch the whole egg for 1 yolk - this will make a slightly firmer mixture which you can shape using wet hands, for a neater burger.